I received a dress from Masala Baby a few weeks ago. This dress is absolutely beautiful! I couldn’t imagine a more beautiful dress. When I first received the dress, my expression was “wow” then “awww”. I can’t wait to give it to the little girl I bought it for. I haven’t had a chance to see her yet, but when I do, her and her mommy will both be in love with this dress. The design is fabulous, the fluffy underneath is something every little girl will really enjoy. The style is unbelievable. 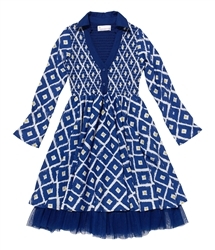 With Winter coming, really quick, this dress could be every little darlings favorite. This particular dress is only $68.00, that’s an excellent value for it’s beauty. I fell in love with this dress, I wish they made it in my size. Masala Baby doesn’t only have girls items, they also have items for little boys, baby items, and even accessories. You really have to check out their site. They also have an organic line of pajamas. This is perfect for the little ones in your life. You won’t find a more beautiful line of clothes anywhere. What an adorable dress. It looks like the kind you can really twirl in. Those are my daughter’s favorites! Such a pretty little dress! I’d love to win it for my niece !! !